Basic Beauty 116 | Light Your Nails! Today's nail polish is by a long discontinued Italian brand. They used to have a lot of shades that reminded me of Zoya's and I really stocked up when they did a closing sale back in the days. A couple days ago my colleague sent me a link to an Instagram photo by Essence. I started looking into my collection for something similar and that's what I came up with. Actually now that I look at it they are not even close haha. 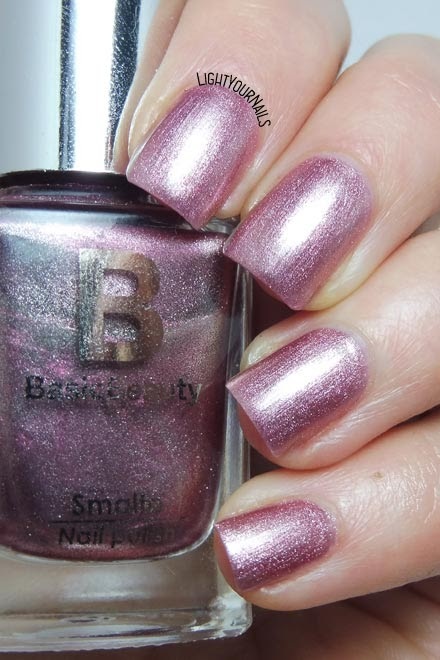 Basic Beauty 116 is an antique pink metallic leaning to foil nail polish. It's opaque in two coats. Formula is really thin and shows every bump or line of the nails. In that, it's a common metallic, not forgivable at all. It's also hard to avoid brushstrokes from showing. Fortunately it looks like a foil meaning it has that kind of highlighting power that catches your attention and everything else is hidden or forgotten. Know what I mean? Drying time was also quicker than I expected. Do you like it? I'm not happy of this shade on my skin tone. My colleague liked it though, but it doesn't look at all like the photos she linked to me. If you are curious >>this<< is it. Do you see it silver or lilac? And do you like it?